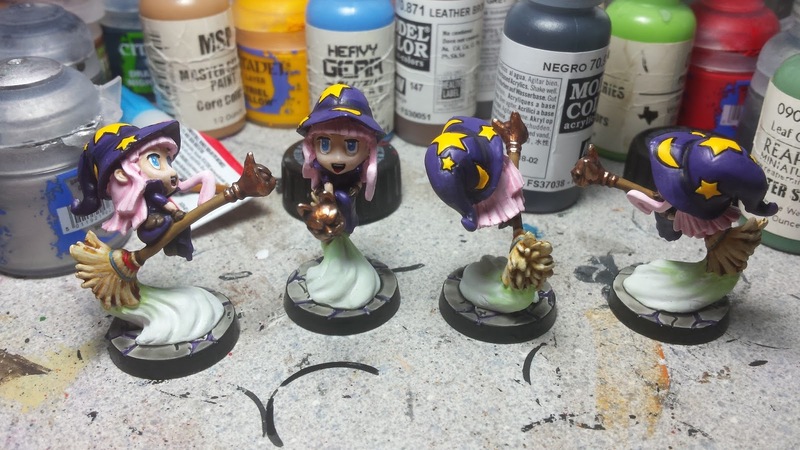 Brush Wizard: WIP - SDE: U-Con Set - Witches and Thundervale Huntress Finished! The witches, you've already seen in the last post. But they are fully finished now. I had a few issues with them. Mainly their horrible sculpted eyes and trying to stay in the lines of their hat details. But I got that all sorted out now. 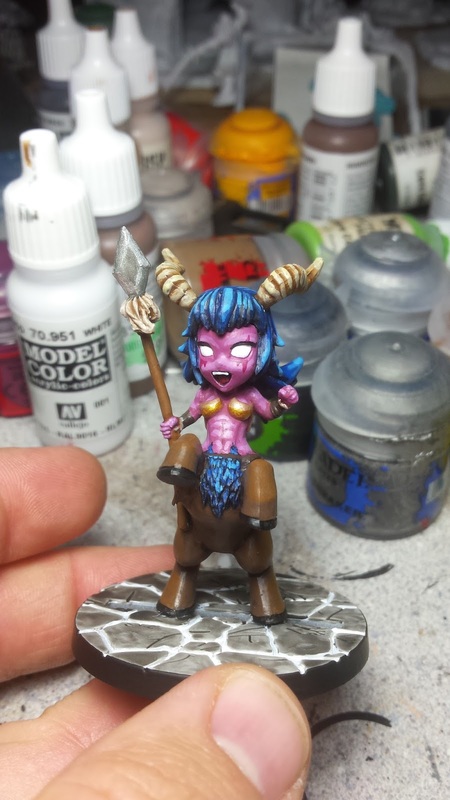 I also paint the final hero for the U-Con set, the Thundervale Huntress. I really wanted to stay away from any My Little Pony references, and I knew I wanted a unnatural skin tone. That's when I had the idea of using World of Warcraft Night Elves as inspiration. So, I did a search and found a skin tone I liked and went to work. She turned out great too! I think she's my new favorite Hero (sorry Claw Tribe Barbarian). Everyone I've shown her to seems to really love it as well. 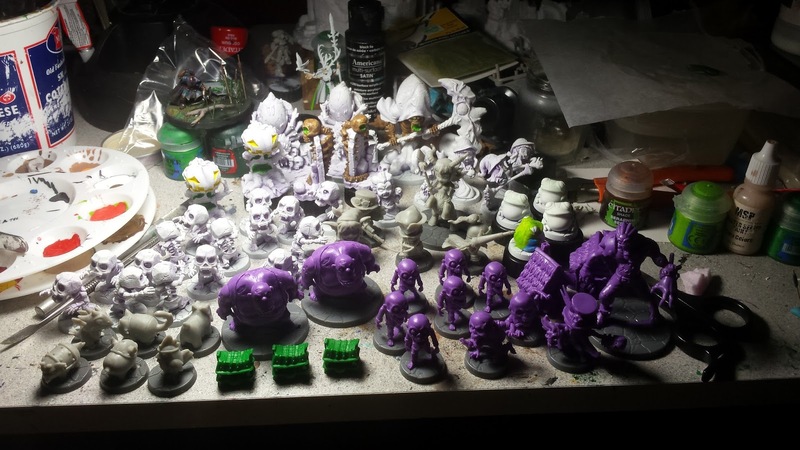 That puts the heroes for Super Dungeon Explore: Forgotten King in the finished pile! And they look great together. It also leaves just the pets and the new Boo Booty chests to go. With the witches and Thundervale Huntress finished, I started matte finishing the finished minis too. For the most part it went really well, until I got to the Fae Alchemist and Death. No matter what I did, both of them ended up clouded by the spray on the back of them. Death was so bad that part of his robes had turned completely white... It was highly disappointing. Luckily, I believe the issue came about due to the can being near empty and that it's now 50s outside where I was spraying, then bringing them into the 65 degree house. Because after I sprayed them with a new can and did so indoors, I had no more issues. 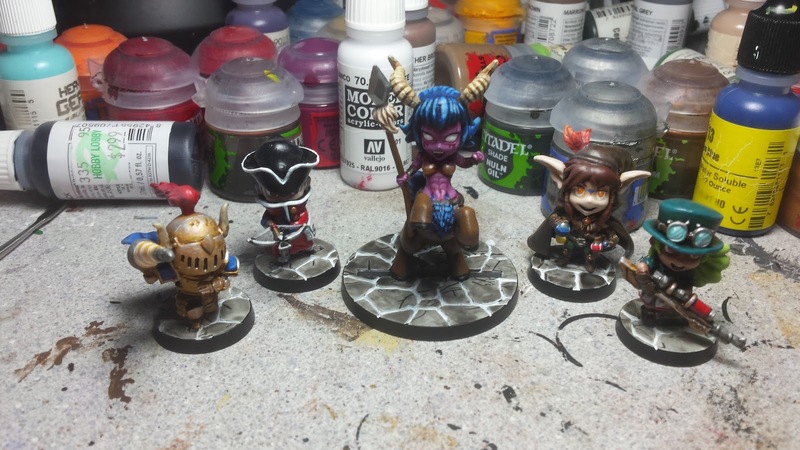 Anyway, I'm nearly done with the minis I need for U-Con. But have taken a bit of a break from them to work on the Halloween themed Finger Painters comp for this month. But I have no worries that I'll be able to get the Pets and Boo Booties done before November 20th.